Just how magical and serendipitous this city is was revealed to me recently with a drive near Piedmont Park and finding an unassuming treasure. Tucked into a corner of the Amsterdam Walk retail district is Sean’s Harvest Market, a tiny, atmospheric food shop with the allure of a European cafe. Turns out, this is precisely the vibe husband-and-wife owners Sean Germain and Amber Chaney seek to achieve. Both Germain and Chaney have been in the restaurant industry for many years. Germain opened the now-closed Solstice Café in Grant Park and Carroll St. Café in Cabbagetown. The two met while working under Kevin Gillespie at the now-closed Woodfire Grill. Chaney says, “We took concepts Sean opened and pared them down to a small space.” Sean’s began in a kiosk at Athletic Club Northeast in 2012; in 2014, they moved to the current space. Sean’s Harvest Market keeps a mindful eye on health but doesn’t sacrifice flavor, thanks to a menu that includes sandwiches and salads that rotate often based on seasonal produce. There are smoothies too. The thick, green Californication, with avocado, orange, spinach and banana, gives a jolt from mint and leaves a lingering warmth from allspice. It’s not sweet, but rather satisfies a savory craving. The bestselling smoothie—the dessert-like Elvis—is quite the opposite. It combines coffee, banana, cinnamon, peanut butter and chocolate. 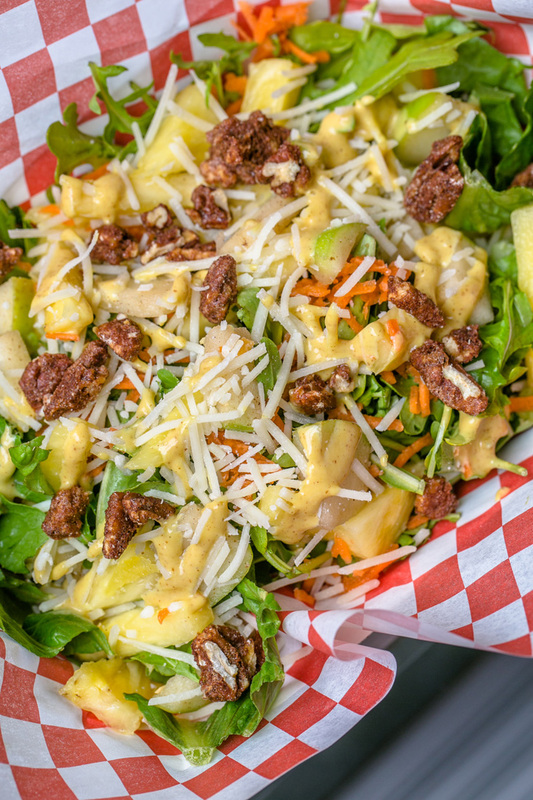 The Go Go South salad brims with baby kale, spiced apple, shredded carrot, Parmesan, mango honey mustard dressing and lightly candied pecans. Everything is made to order in the tiny kitchen equipped with a flattop, a grill and a convection oven. The crew has choreographed a sort of ballet that allows them to move around in the tight space. The Sean’s motto, “A place for everything, and everything in its place,” is adhered to religiously. Each member of the kitchen crew knows how to perform every function and everything is reachable in an organized way. Baskets sit on the countertops, their contents differing on each visit. The fruits and veggies inside are a hint to specials that day. I watched a chef core and cut up a whole pineapple for my Go Go South salad with baby kale, spiced apple, shredded carrot, Parmesan and mango honey mustard dressing. Lightly candied pecans added crunch to the bright flavors that meld seamlessly. Salads here are bursting with color, texture and flavor, and are quite filling. My favorite version was the Go Go salad with a well-crafted mix of nutty black rice, romaine, shaved carrot, slivers of almonds, shaved basil, tomatoes and quinoa sprinkled throughout. A flavor explosion ensued with the addition of a cream of pesto and dill dressing, made ever so silky with a clever base of avocado. Proteins can be added for a small charge, but salads are filling without the addition. 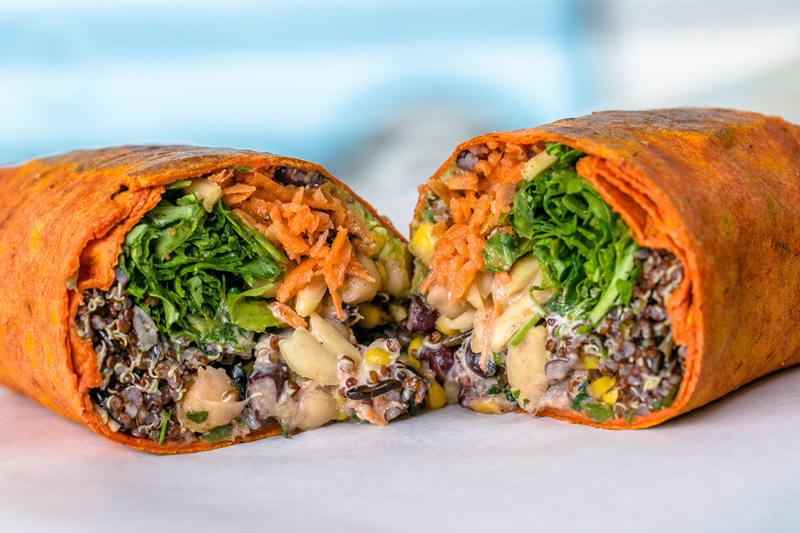 The BeltLine Burrito is packed with black bean-and-corn salsa, black rice, quinoa, guacamole, carrots, Parmesan, arugula, guacamole and almonds. Skip the cheese for a vegan treat. 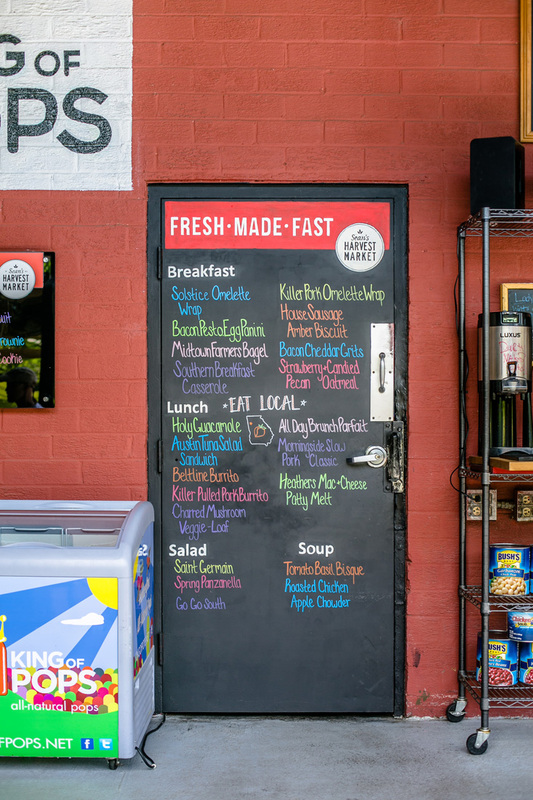 A blackboard lists fairly straightforward sandwiches, but each offers innovative flavor combinations and the life-giving spark of the perfect condiment. Take the Holy Guacamole: This chicken salad starts with toasted wheat filled with finely chopped roasted chicken, bits of shredded carrot, chopped romaine and apple minced so finely I didn’t know it was in there. It’s bound together with a spicy avocado cream. It has lightness rather than the usual fatty denseness of standard chicken salad. The BeltLine burrito, chock full of black bean-and-corn salsa, black rice, quinoa, guacamole, carrots, Parmesan, arugula, guacamole and almonds, is packed with flavor and fills you up. It’s a satisfying meal in a tortilla, and can be made without cheese to suit vegan patrons. The mushroom veggie-loaf sandwich is similarly satisfying. Roasted portabello mushrooms stand in for meat on a locally made Engelman’s knotted roll. A cool slice of tomato and crisp layer of romaine give a bit of bite to the delicious mushiness. Its only drawback is the intensity of garlic that lingers. Sean’s Sausage Amber biscuit oozes with melted cheddar, a griddled egg and apple butter or roasted onions and rosemary. Add a soup or side to sandwiches and salads for a mere buck-fifty. Tomato basil bisque tastes as it sounds—a basic yet delightfully thick tomato soup with basil—but the roasted chicken apple chowder is densely flavored. A bowlful is more like a chunky, curry-laden ragu. Get one to go, and it makes a meal over rice. Burnt garlic and cheddar grits are similarly flavorful, with ribbons of cheese running through them. Truffle mac and cheese is less creamy than I prefer, but definitely cheesy and with a hint of real truffle flavor, not the usual overpowering truffle oil. It’s homey, like a chunk out of a family casserole with crispy bits of cheese on top. Breakfast is served all day. 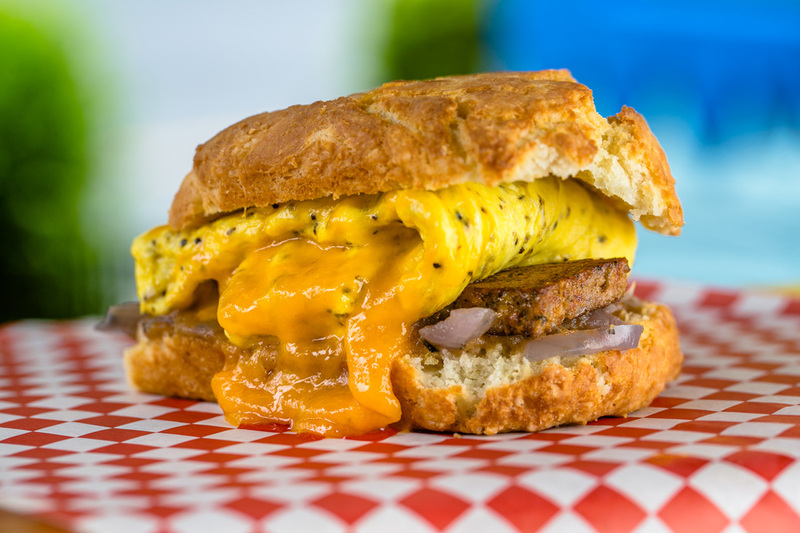 A big seller is the Sausage Amber biscuit with a house-made patty, melted cheddar, griddled egg and either apple butter or roasted onions and rosemary. Choose the latter for its subtle sweetness of long-cooked onions and the herby freshness of rosemary. Chaney makes the massive drop biscuits each morning using a recipe of her grandmother’s reworked to make them higher, with more weight that she explains is “friendlier for sandwiches.” Alone, while huge, they are still light and fluffy. Each day she makes a special biscuit: blueberry, chocolate chip and even pecan pie. 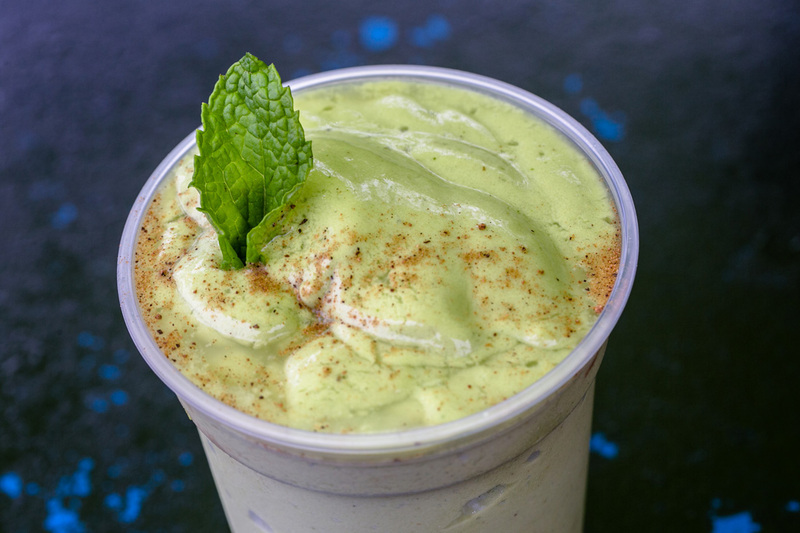 The nutrient-dense Californication smoothie contains avocado, orange, spinach, banana, mint and allspice. On a visit together, my son and I lingered outside on the patio. I swigged an All Day Energy smoothie, and he sipped one of the many coffee selections. Sean’s only serves Dirty Nekkid coffee that roasts beans here in Atlanta and sources some from the company’s own coffee farm in Nicaragua. Prices: Breakfast items $5-$13. Salads $7. Sandwiches $6-$9. 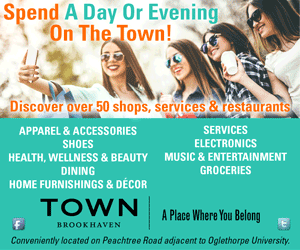 Smoothies $5.5-$6.5. Sides $4. Treats $2-$5. Recommended: Californication smoothie ($5.50), Holy Guacamole Chicken Salad Sandwich ($8), Go Go Salad ($7), Special Amber Biscuit ($8), BeltLine Burrito ($8). Bottom Line: Sean’s Harvest Market serves up feel-good food, fast.